has been updated with some corrected dates. I've also attached flyers Susie sent out by email. 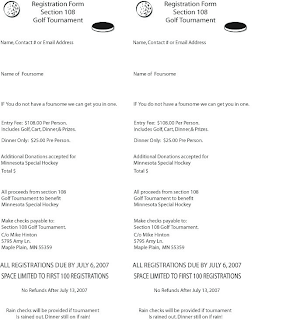 The www.mnspecialhockey.org - Minnesota Special Hockey site is largely working now. Susie has been busy adding information to the site. I'm also doing ongoing testing and we should be ready fairly soon to add more user accounts and email addresses. USA Hockey changes mean we have to reorg our site. I've temporarily switched both news.mnspecialhockey.org and www.mnspecialhockey.org to point to this blog. In the meantime I'm preparing our new home our new home on Google's servers. 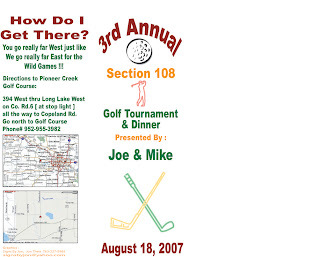 Once that's done we'll have a range of services there all of us can use and both this blog and our other services (calendar, etc) will all have the mnspecialhockey.org address. I'm hoping to get this done by 7/25/07. Update 7/21/07: This is a complex move, and I expect we'll have some service interruptions. July is a good time to be doing this! Update 7/21/07: We're not in bad shape at the moment, though the photos are offline for now. The new web page and calendar are loading. Update 7/24/07: We might be done with the first phase. The redirects are working and so is the old photo link. The internal email systems are working, and I've added one user (Susie Miller). My account is still admin@mnspecialhockey.org, I'll transfer that to an official admin when we have one and create another user account for me. The blog (news.mnspecialhockey.org) is still "mine" but when Susie gets comfortable with the new site I'll add her as an admin. In the next year I want to transfer the domain to our organization as well, that will take a little bit of work. Next up will be creating additional user accounts, all email will redirect to preferred accounts. We'll also create some email lists and upgrade to Googles non-profit offerings which are more robust. Susie Miller writes with an update for the 2007-2008 Season. There are TWO golf tournamens in August, one on the 18th and the other on the 27th. If you can attend either one please let Susie know. We are also going to be a part of another great tournament...please see the email below I received from one of the Hockey Docs. This tournament will be another great opportunity for our program. As stated below they would love to see some of our players at the event. Susie also included an email from a "HockeyDocs" a MN charitable organization of hockey playing physicians. She encourages our hockey players to drop in and say hello. .... I have already visited the [MN Special Hockey] website and Lenore had told me about it too. It does sound amazing and it fits in nicely with the HockeyDocs mission of raising money for Minnesota kids. We are expanding our venue this year and Mark Parrish of the Minnesota Wild is joining our team through his newly created charity 21 for Kids. We are updating our website (www.hockeydocscharities.org) but if you go there you will get the general idea of the event which takes place on August 26th and 27th. As you will see, we went ahead and added your logo to our site. 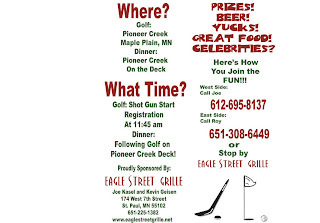 It would also be great to see if we could get some of the kids in Minnesota Special Hockey to attend the event.